With more folks than ever choosing to hunt with a handgun and the continuing resurgence of the 10mm cartridge, we decided it was time to bring the heat. 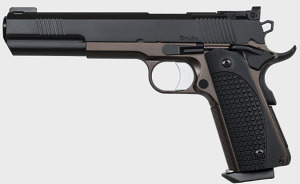 Our first long-slide 1911, the Bruin was born to hunt. The long slide means a long sight radius and the 6 inch barrel within allows full-power 10mm loads as much time as possible to use their powder charge. Fully adjustable tritium sights ensure when shooting hours arrive, you will be able to see the sights. Not only that, but we are using a tritium/fiber optic combo front sight to make sure the front glows day or night.